I adored the uniqueness of A Little Something Different, so I was super excited to find out that Hall had a new book coming out. Signs Point to Yes is a good second novel; equally as light, fun, and serious as her previous work. Jane and Teo were fun characters, with well developed personalities and quirks that brought them more fully to life within the course of the story. Even the secondary cast of Ravi, Margo, and Teo's trio of half-sisters were three dimensional and loveable. I did find Signs Point to Yes to be a bit less engrossing than A Little Something Different because, even though Jane and Teo were well fleshed out characters, I just didn't connect with Teo as much as I did Jane. Though, that probably has a lot to do with the fact that Jane was a very similar brand of nerdy as I myself am. Hall does do a wonderful job of portraying Teo's insecurities over not knowing his father. And the feeling of outsiderhood I imagine family gatherings would push onto him. The ending left me a bit at loose ends, not really sure if I was all right with where Hall left us. Maybe I'm just greedy, and want to know more about the burgeoning relationships between Teo and Jane, and Margo and her possible significant other. 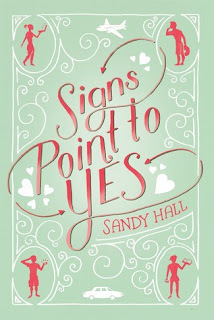 All together, Signs Point to Yes is an enjoyable read, with some definite beach read potential, that I will more than likely reread.